it’s been a while aku tak post anything. didn’t get the time to sit and pour my heart out. nak kata very busy, idak lah sangat tapi tiredness after working makes me lose the mood for blogging. Sometimes you wonder why ALLAH makes the sun disappear, let the bolt and lightning strike us. Then you realise ALLAH wants to give you rainbow to make life better. kids are getting bigger and they fly all over. 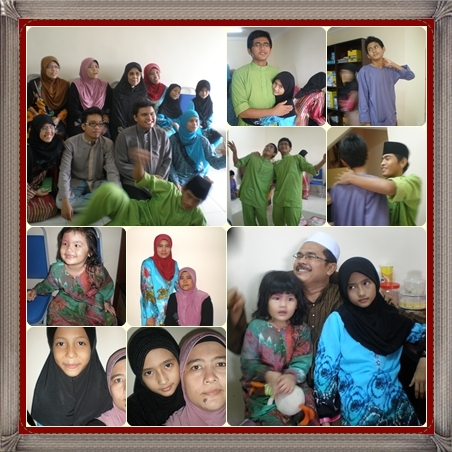 raya is the only time that we parents can bring them together and get to know everyone in the family. every year we will always have new thing to share and cherish for the rest of our life. let the differences and selfishness a side. make use raya for the current year wisely for we never know if there’s another raya for us. i love every one of you, Abdul Karim and Abdul Wahab family. InsyaAllah, next raya we’ll be together again.